Running Press Adult, 9781416970477, 80pp. Summer days are here again! Here are over forty sidesplitting poems about summer vacation, covering everything from the much-anticipated last day of school to family road trips, wacky days at summer camp, learning how to swim, dizzying roller coaster rides, fun-filled days at the beach, and finally, the dreaded first day of the new school year. 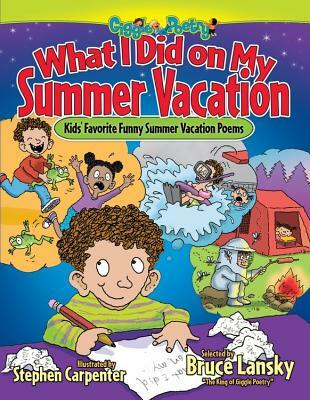 These hilarious poems written by Bruce Lansky, Kenn Nesbitt, Robert Pottle, Eric Ode, and Neal Levin, and the rest of the all-star gang of Giggle Poets are sure to make you count the days until summer vacation begins! Bruce Lansky has been crowned the “King of Giggle Poetry” by his elementary-school admirers. Lansky has edited 11 poetry anthologies and three silly songbook anthologies, and has written four collections of his own poetry. Altogether, his poetry and songbooks have sold over 3 million copies. Lansky created the popular GigglePoetry.com website for children and the PoetryTeachers.com website for teachers. He is a popular speaker on the school circuit, performing in more than 35 schools and teacher conferences each year. He lives in Minneapolis, Minnesota, when he’s not visiting out-of-town schools and bookstores).